Oh, Kay, it’s lovely!!! I know I want a copy just from the cover!! I haven’t even gone to look at the inside yet, but I will. Oh thank you Robin!! Thanks for sharing in my happy day. What a great idea for a book. I love that it has the option of 5 sizes. Perfect. I will be going to amazon as soon as I leave here. It is a beautiful book! The white background for the blocks is very striking and the blocks are wonderful. Congrats Kay!! I love that you have them in sizes. I seem to find some patterns too big or too small, so you have definitely come up with a wonderful idea. Congratulations Kay! From a fellow author & publisher who knows how much love, sweat, and tears go into writing a book. You should be so proud. Celebrate! I can see why you are excited. I’m kinda excited about it myself. I’ve been searching for a book that has the blocks in it that are “just right” for me. I’m a beginner at applique, but I want something that will start me out, but be beautiful too, and keep me challenged going forward as well.. This looks WONDERFUL. Thanks for all your hard work! Congratulations, Kay! I just looked at Amazon, and the blocks are absolutely gorgeous. You’ve come a long, long way from our first messages about publishing in 2002. Quilt Puppy must be proud of you too. Rock on! What a gorgeous book. I pre-ordered a copy from amazon. Can’t wait to get it in March. I will bring it to the PVQA meeting for you to sign it. Congradulation!! It looks like a great book and I love the idea of being able to print out different sizes of blocks. I saw that advertised in the Martingale catalogue and said: “Oh look, there’s Kay’s book!” I can’t wait to look at it, it looks gorgeous! Congratulations! What a thrill! HOW EXCITING !!! CAN YOU STAND IT ??? SNAPS TO YOU !!!! Thank you so much all you guys!!!!!!!! 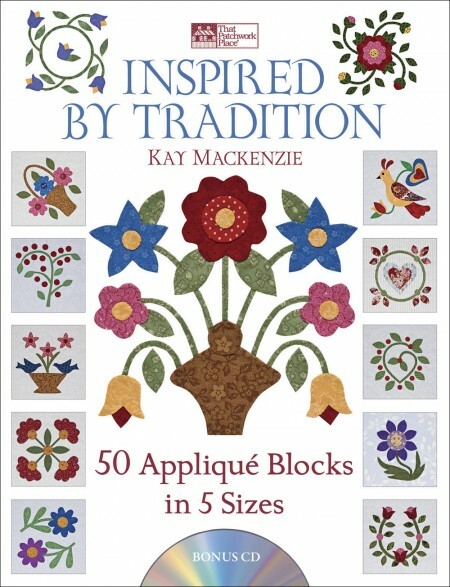 I recently purchased your new book and I must say that it is the best applique book I have ever seen. The patterns are wonderful and that fact that you can print them in different sizes is great. I recently have tried your new applique method and love it. Can’t wait to see if you come out with another book! Paulette, thank you so very much for your wonderful words!! You’ve made my day!